Seminarians have the opportunity to complete a lot of reading. After evaluating my reading diet over the past few years, I was a little discouraged by the limited amount of assisted reading that was either written by women or writers of color. Therefore, my original desire was to read several books that were written for or about women this summer. I did not get through nearly as much reading as I would have liked, but this book was certainly at the top of my list. I was just itching to get to it as I saw the bright yellow quotes displayed on Pinterest. I can certainly understand why some Christians would shy away from reading a book like this. After all, the title includes the dreaded “F” word. 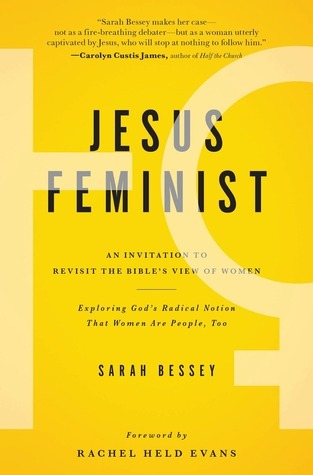 The words “Jesus” and “Feminist” cannot possibly go together. Or can they? I found this book quite delightful and refreshing to read. The author invites the reader into a conversation by a bonfire on the shore, so I think any woman who likes bonfires, seashores, and conversation should probably add this book to their reading list. Feminism only means we champion the dignity, rights, responsibility, and glories of women as equal in importance—not greater than, but certainly not less than—to those of men, and we refuse discrimination against women (13-14). With this definition, she begins the conversation to usher us all on to pursue the redemptive way of the gospel. In the conversation, Sarah explores gender roles; Paul’s word concerning women; women as spiritual warriors, saints, and midwives. Sarah also affirms our deep need for community, as women advocate for the global concerns of the world. I really enjoyed this book. Sarah and I have much in common, from our love for Jesus and commitment to his church, to bearing unimaginable losses, to our wilderness experiences and weariness with the same old conversations in the church. I get her. I think she has weathered the storms and risen as a peacemaker, reconciler, and person of grace with this testament of a book. Because of this weathering, she is more confident as a woman of God, disciple of Christ, wife, mother, and minister. As am I. After reading this book, I would encourage women, “Don’t be afraid to live authentically, ask hard questions or go against the grain. Christ has set you free. Sarah writes, “We are creating a world where every women can be who see is, without apology, in freedom.” Commit to following Jesus wholeheartedly and dwell in a safe community that will allow you to walk in your freedom and grow in spiritual maturity as the person God created you to be. Stop trying to perform, meet impossible obligations, or evaluate your worth based on the expectations and standards of outsiders. God is writing your testimony and the path is uniquely your own. I invite you to get on the path and keep walking. So honoured to be reviewed here, Natasha. Thank you for such a thoughtful reflection! Glad to be alongside of you.